The new year is a time to eat a little lighter and fresher after the indulgence of the holidays. Here are three great recipes that are quick and delicious for a quick weeknight meal or outdoor gathering. Combine basil, oil, pine nuts, and garlic in a blender. Blend until paste forms, stopping often to push down basil. Add the cheese and salt; blend until smooth. Transfer to a small bowl. Bring the pasta to boil in large stockpot and cook according to package instructions. Remove from heat and pour through a strainer when cooked. Pour into a large mixing bowl. Add grape tomatoes, pesto and combine. Serve warm or at room temperature over a bed of greens. Yields four servings. 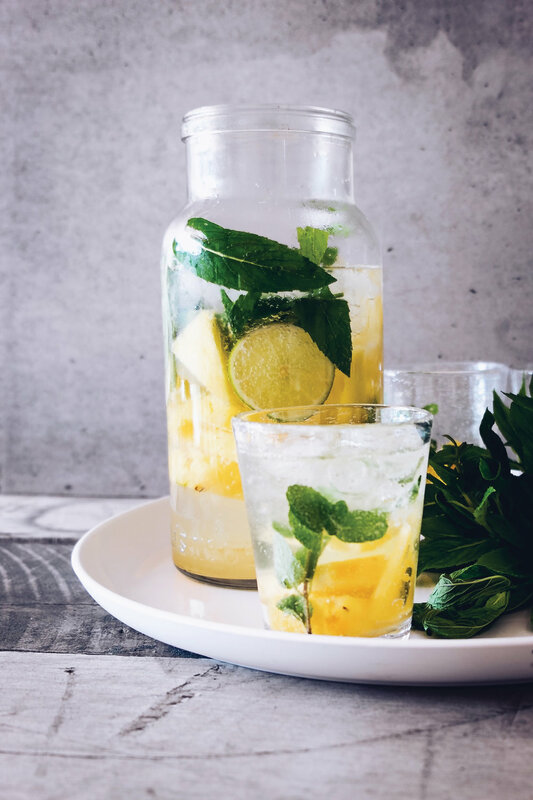 Pour filtered water in a large jar or pitcher. Add sugar and freshly squeezed juice from the lemons. Start with two lemons and then taste. Add more lemon juice if desired. Stir until the sugar has dissolved. Add the mint sprigs and lemon slices (from 1 lemon). Cover pitcher with a lid or plastic wrap and place in the refrigerator for at least two hours to allow the mint to infuse with the lemonade. Garnish and enjoy! Yields four servings. Quarter tomatoes, and toss them with garlic, olive oil, vinegar, basil, salt and pepper. Mix in the minced garlic, 1 tbsp. extra virgin olive oil, and the balsamic vinegar. Note, tomatoes love salt; you may need to add more than you expect. Slice baguette. Brush one side of each slice with olive oil and place olive oil-side down on a baking sheet or roasting pan. Place the pan in the preheated oven on the top rack and toast bread for 5 to 6 minutes until lightly browned around the edges. Remove and cut a clove of garlic in half and rub over the warm, toasted side of the bread and then spread a light layer of ricotta cheese over the toast. Arrange the toasted bread on a platter, olive oil side facing up. You can either serve the toast plain with a bowl of the tomato bruschetta mixture on the side for as a self serve option, or use a spoon to top each toasted bread slice with some of the tomato mixture. If you top each slice individually, do so right before serving. Yields 6-10 appetizer portions.